Northern Canaan Conquered - "Then it came about, when Jabin king of Hazor heard of it, that he sent to Jobab king of Madon and to the king of Shimron and to the king of Achshaph, and to the kings who were of the north in the hill country, and in the Arabah - south of Chinneroth and in the lowland and on the heights of Dor on the west - to the Canaanite on the east and on the west, and the Amorite and the Hittite and the Perizzite and the Jebusite in the hill country, and the Hivite at the foot of Hermon in the land of Mizpeh. They came out, they and all their armies with them as many people as the sand that is on the seashore, with very many horses and chariots. So all of these kings having agreed to meet, came and encamped together at the waters of Merom, to fight against Israel. Then the Lord said to Joshua, 'Do not be afraid because of them, for tomorrow at this time I deliver all of them slain before Israel; you shall hamstring their horses and burn their chariots with fire..' So Joshua and all the people of war with him came upon them suddenly by the waters of Merom, and attacked them. 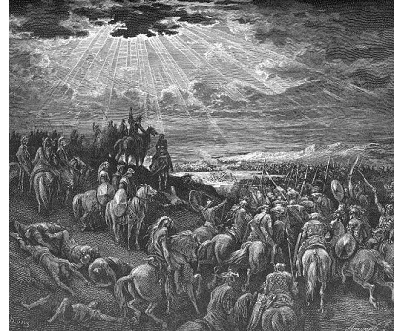 The Lord delivered them into the hand of Israel, so that they defeated them, and pursued them as far as Great Sidon and Misrephoth-maim and the valley of Mizpeh to the east; and they struck them until no survivor was left to them. Joshua did to them as the Lord had told him; he hamstrung their horses and burned their chariots with fire. Then Joshua turned back at that time, and captured Hazor and struck its king with the sword; for Hazor formerly was the head of all these kingdoms. They struck every person who was in it with the edge of the sword, utterly destroying them; there was no one left who breathed. And he burned Hazor with fire.